This is a unrefined, cold pressed virgin 100% Pure Certified Organic Rosehip Seed Oil - No fillers. Naturally rich in essential fatty acids (Omega 3, 6, 9) and antioxidants (Vitamin A and Vitamin C). Great Moisturizes for dry skin, hair, nails, stretch marks, scars, spots, psoriasis and eczema. I love all natural and organic skin and makeup products! This product is great for stretch marks and scars, I really can see how this oil has improved the appearance of my old stretch marks from my pregnancy and the scars on my legs are beginning to fade. This is worth a try for the skin care conscious out there, also the quality is so much better than other brands that have rosehip oils that are triple the price. I just mix a couple drops in my usual body lotion and gently pat my entire body until everything is absorbed, also if you have very dry skin you can apply it directly to your skin or just simply pat. My skin is not sensitive so I personally don't know if maybe its great for sensitive skin types or not buy I know for sure that natural/ organic skin and makeup are MUCH more beneficial to any one skin then the ones that are Loaded up with Chemicals, Fragrance, and so on. My skin felt a little oily initially but the oils soon sank in. This blend worked overnight to soothe my skin without any adverse reaction or blocked pores. I think every night it would be excessive but certainly three or four times a week and my skin has a subtle glow and is much more evenly toned. And the oil is so quick to absorb into my skin! I was dubious at first, I'll admit, because my skin didn't feel like it normally did after using my old products. However, after a couple of days, I realized why it didn't feel the same: it felt much better! I also use this for my hair! I had not cut my hair in a while and had bad split ends and I could feel the coarseness and I used it on my ENDS only where my hair was not touching my scalp and it was magnificent. My hair was so smooth and you could not tell that I had split ends. Also for increased texture put 2 or 4 drops on wet hair & let dry. The color is dark, reddish, rusty orange (the way unrefined, organic rosehip oil should be) and very fresh. It comes in a big dark dropper bottle to preserve the freshness, as rosehip oil is sensitive to air and light. *Nourishing the skin deeply to make the skin smoother and more even. 100% Pure USDA Certified Organic Rosehip Seed Oi. NO CHEMICALS, NO ADDITIVE, NO ADDED FRAGRANCE. Imported from Chile. Take 2-3 drops of Rosehip Seed Oil on your fingertips, rub the fingers together and gently massage the oil on clean and dry face, neck, hair, scalp and related areas. 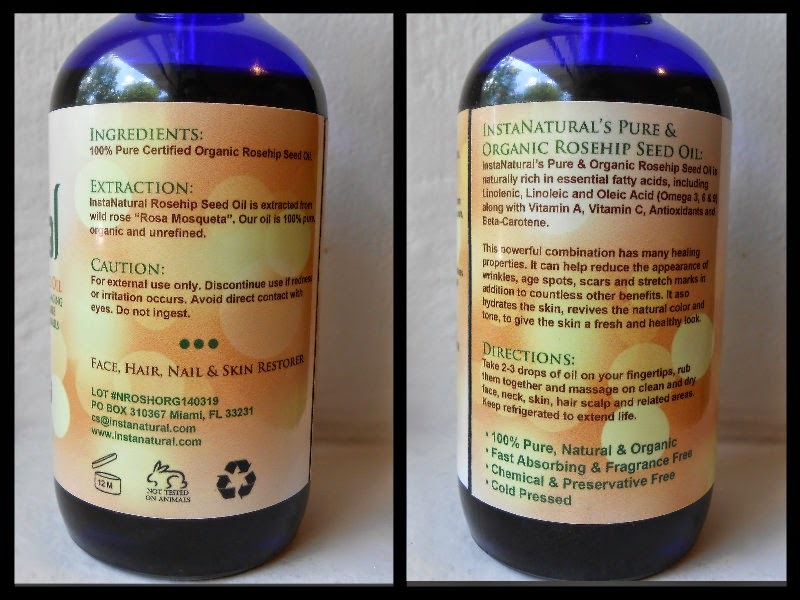 InstaNatural Rosehip Seed Oil is for external use only. Do not ingest. Discontinue use, if redness or irritation occurs. Avoid direct contact with eyes. I really love this oil for my light stretch marks due to pregnancy as well. My hair could use a boost, I need to try this and see if it helps. Nice review. I will have to remember this for when my kids get winter eczema. Thanks! Thank you for the information. Knock on wood, but I haven't been getting dry skin for about a year now. I've heard of the benefits of rose hip oil, but have not really tried it. I've heard of using rose hip oil for scars but never tried it. Thanks for sharing! Rosehip seed oil seems to have many great benefits. I definitely would love to give it a try. I've tried different oils before, but not rosehip - I think I'll have to give it a try! Thanks for the review! One of my favorite oils it's rosehip, I need a big bottle for this pregnancy stretch marks!! I love Rosehip oil! I will need to check out this brand. I wish we had that here in the Philippines. This really helps to prevent dry skin and it helps that it's organic. this sure is one potent oil + it has numerous uses + benefits. i wouldn't mind having a bottle or two in my beauty/health statsh! Thanks for helping me learn something new today! Thanks for the review! I know someone who needs this perfectly and I know Rose Hips oil also fade scars if i am right and then I need this too. Great review ! Sounds like a great product! I think I need to try it out! I am always on the lookout for great new products! Thanks for sharing!